A cruelty-free, soft and lightweight makeup brush set in a compact case. What qualities do you look for in a makeup brush? For me, bristles must be soft and well-packed, the brush must not be too long or heavy and it must not look or feel cheap. Plus, I must be able to find some use for it in my makeup routine, even if it may not be the use the company intends. With lightweight bamboo handles, aluminium ferrules and synthetic taklon brushes, the 10-piece cruelty-free bamboo makeup brush set from Missamé (PR sample*) pretty much ticks every box in my checklist. They are 'pettably' soft, and come with a travel-friendly pouch. They look and feel sturdy - I've sat on two of the eye brushes (don't ask; blame my niece) and nothing happened. Missamé, founded by animal lover Amy Ng, is a California-based brand that launched their cruelty-free makeup brushes last year. Their aim is to make professional-quality brushes at affordable prices and they offer a satisfaction guarantee. How much do you think this set costs? Guess! You will know the answer towards the end of the post. Check out my thoughts on the 10 bamboo makeup brushes from Missamé. The brushes come in a compact satin brown case, which weighs 187gm with the brushes packed inside. That is perfect for travelling. I first contemplated breaking up this set and moving some of these to my daily-use rotation. Then I realised these would make the one complete set I need - I have some international travel coming up, so this set will definitely go along with me, and it will take up little volume in my suitcase. There was a plastic smell on the case that disappeared after a couple of days of open air exposure. If you have used Everyday Minerals brushes, the bamboo is equally lightweight, though the Missamé handles have a smoother and glossier finish. I don't always follow what companies say and use the brushes for whatever purpose that suits me. Here is how I use the brushes in this set. How is that for density? This is about as dense, soft and flexible as the Bdellium Tools Precision Kabuki 957, and the bristles are exactly the same length, though the handle is smaller. Somehow, because my favourite flat-top brush is the IT Cosmetics Heavenly Luxe Airbrush Foundation brush, I like my flat-tops a bit denser. A softer, plusher, fuller version of the Real Techniques Buffing brush, with slightly longer bristles. For buffing in powder, I prefer the length of the Missamé brush to the longer RT, which often feels unwieldy when I try to touch up. This is my second-favourite brush in this set. Nope, I don't use this brush for contouring. I don't contour anyway - because I cannot get it right lol. This brush is similar to the Sephora Pro Airbrush Concealer Brush 57 - I'm sure there are enough fans reading this to say "ahhhh" while thinking of That Amazing Concealer Brush. I am so obsessed with the 57 and already have two - the platinum and the new black versions. Ever searched high and low for another round concealer brush like that? Seek no further. The bristles on the Missamé brush have the same arrangement and softness. The handle is shorter, which gives me better control while applying concealer and there are no brush marks. The bristles are denser and a few microns longer than the 57, so this is a great choice for liquid and creamy concealers such as Healthy Mix, NARS Creamy Concealer and IT Cosmetics Bye Bye Under Eye. This is my favourite brush in this set. While I prefer the Original Beautyblender for liquid and powder foundations alike, this is one of the nicer paddle foundation brushes out there - most seem to be too thin for my liking. I love the Pixi version and this is very similar in length, density and bristle arrangement. The head is thicker and denser than the MUA foundation brush and Bdellium 948. I have seen a couple of sheds in the first wash but nothing after that. If you've used the older Sephora platinum brushes, this is a smaller version of the Powder 50 brush, which I love for bronzers and blushes. Bristle arrangement, flexibility and density are similar, though the Missamé version has shorter bristles by a few mm, and shorter handle. It picks up and blends product as well as the Sephora 50. Nice for inner corners and precision work. It reminds me of the smudge end of the Dual Eyeshadow brush from Crown. This is clearly an eyeshadow shader brush, thick and dense enough to pick up a lot of product (see further below in this post). The bristles are not too long, thank goodness. Most blending brushes are too long for my tiny, deep-set eyes, and I had to give off the Stila All Over Blending Brush 9, for instance, to my Mum. That was gargantuan. This is exactly as flexible as I like my blending brushes. I prefer angled eye brushes for the crease now. This is a good brush for defining the crease and outer "V" nicely. I use this for my eyebrows and to add a base eyeshadow to my browbone. I prefer the Beautyblender Detailers angled brush for eyeliners as the brush itself is at an angle and the head is insanely thin. These are plush and gentle on the skin. All the brushes pick up quite a bit of product - I am a heavy-handed swiper. I find one swipe to be more than enough, be it for the eyelid or for bronzing the cheek. From clockwise, left: Blush brush with Physician's Formula bronzer (review coming up); eyeshadow shader brush (they call it concealer) with Cargo Cosmetics Croissant eyeshadow - that's a LOT of product, isn't it? - concealer brush (they call it contouring brush) with IT Cosmetics Bye Bye Under Eye; Angled Eye Brush with Cargo Cosmetics Versailles eyeshadow; eyeshadow shader with theBalm Benvenuto eyeshadow and the Dome blending brush with an unnamed pink eyeshadow from Sephora's Blockbuster for the previous year. This is how much eyeshadow (Cargo Cosmetics Croissant - the full palette is reviewed here) I got out of that one swipe. I use Johnson's Baby Shampoo with pretty much everything and it works fine with the Missamé brushes as well. I haven't seen shedding so far, but remember that I haven't used these for months on end. The blush brush gave me a bit of trouble to get the lather out, and I was squeezing out the soap for a while afterwards. These dry quickly enough in a humid environment. These 10 good quality brushes are a steal - for just $39.97. When I first saw the price, I expected these to be thin, scratchy and cheap-feeling, with horribly tinny ferrules, lots of shedding and hollow handles. I was wrong. These are plush and soft, and sturdy with smooth bamboo handles. They certainly look (and feel) a lot more expensive, don't they? What was your guess? Some of these brushes already feature in my everyday concealing, eyeshadow, powdering and bronzing routine. I rate these brushes above the RT brushes for practicality, packaging and price. For instance, RT's "crease" brush in the starter set is too large for my deep-set eyes, and I'm not a fan of the thin and pointy foundation brush in their Core Collection. The weight and compact packaging of the Missamé brushes make them a great set for travelling. I usually cartload a dozen or so makeup brushes in two rolls, so it is nice to be able to travel with just 187gm of makeup brushes. 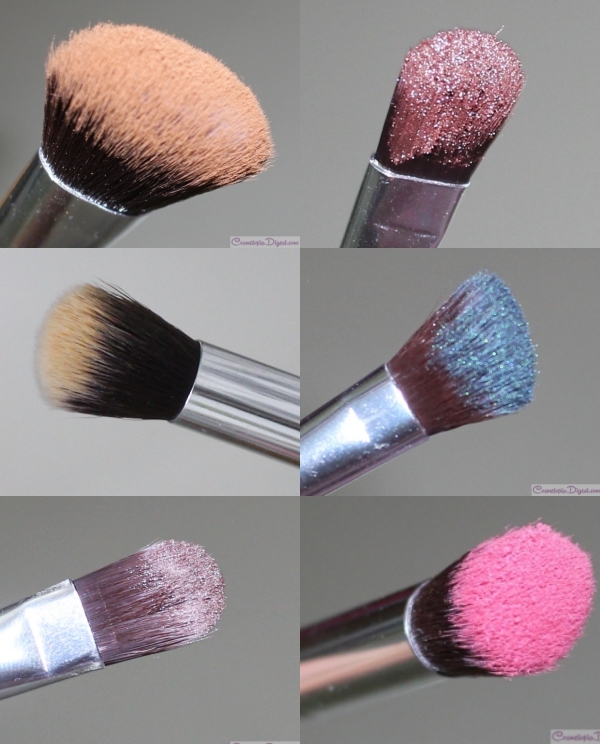 I would have liked to see another blush brush - like the Everyday Minerals Face Sculpting brush or Beautyblender Detailers Plush brush or a smaller version of the RT Blush brush to round of the set nicely. You can find these brushes here on Amazon - the original price is $69.99 but they sell for $39.97. They ship worldwide. At $39.97, this is an insanely inexpensive set - even a set of eye brushes at the same quality tends to cost as much. Did you guess the price right? And what qualities do you look for in (a set of) makeup brushes? Do share! *PR sample. I received these for review purposes. Regardless, I only recommend products I use and love personally and believe will be useful for readers.